Because I just had to hijack the name and make it about me somehow. Things Nigerians Love is a Nigerian label I have so much love for. They exhibit all the qualities I look for in a burgeoning Nigerian label; serious style, unique pieces, affordability (most importantly) and growth....the latter especially. Their growth has been phenomenal, their first collection impressed me and when I viewed their last collection and received the pieces I literally did a little jig......my girls knocked it out of the park. I literally couldn't decide on what I wanted. These are my favorites below, you can view the rest on thingsnigerianslove.com. Will you look at those delicious prices and fabulous pieces......LOVE! Yup, you read right....everything in this online store retails for below N5,000. Still your beating naira conscious heart. You guys know how I bat for affordability and The 5k Shop is truly flying that flag. I am so excited at what a madcap, amazing idea this is and I already have my eye on a heart-shaped frying pan. But please, pay me no mind, hear it straight from the geniuses themselves. 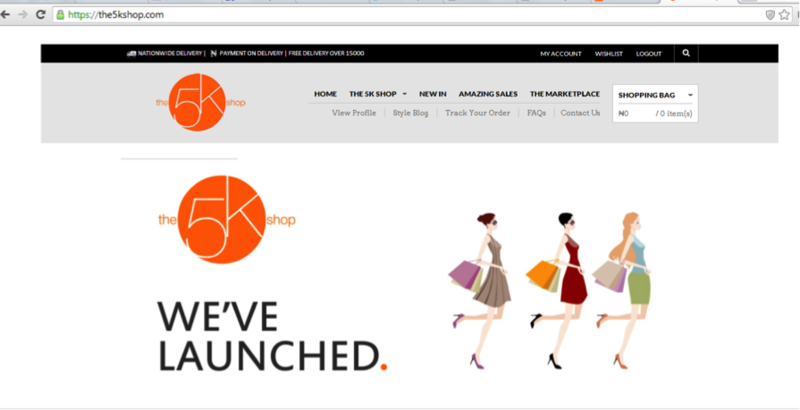 The 5k Shop is an independent online retailer based in Lagos, Nigeria which officially launched on the 5th of April, 2014. We offer a wide variety of products ranging from branded products (UK and US) to our own label; We understand your wardrobe and wallet are personal that is why there is a price cap of N5000 on our site, our promise is that no item we stock will exceed N5000. 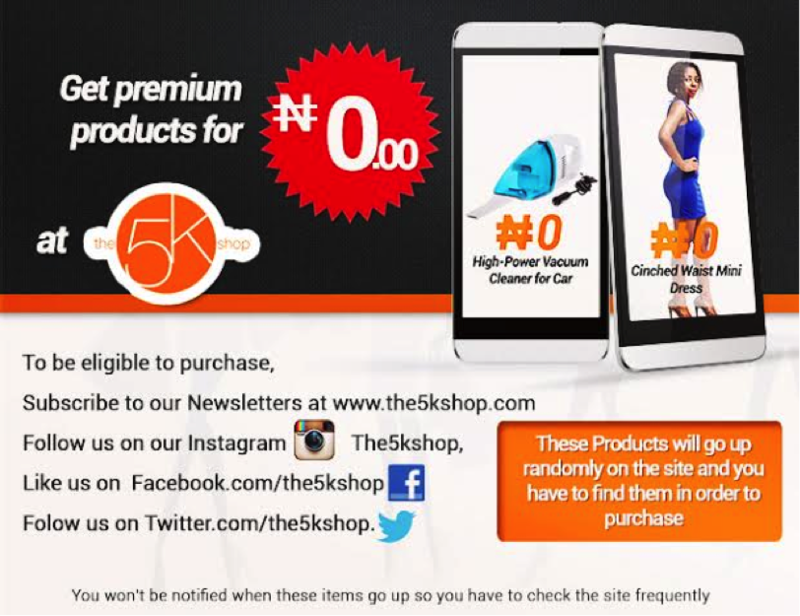 However, with our unbeatable range of affordable quality products, you get all the value for every kobo spent. We offer Nationwide Delivery with free delivery for orders N15,000 and above (Lagos only). All major cards are accepted on our payment gateway which is CBN approved with SSL certificates, 24/7 monitoring and other myriad methods to keep you totally covered! We also offer other payment methods for your convenience like Bank Transfers and Cash On Delivery. What’s more? 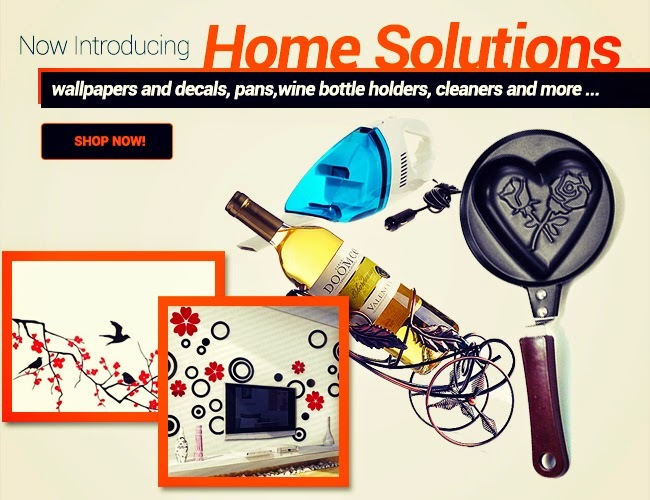 Our stock is not limited to fashion; we have just added a wide range of home solutions like wall papers, decals, home and kitchen elements. The5kShop has developed an easy and smooth return policy, we work hard at ensuring you derive utmost satisfaction from our products but in the unfortunate event where you have been sent wrong or faulty products, please let us know within 24 hours of receiving the product and we will arrange a pick up on our tab. Please read more about this in the Pre Sales Segment of our FAQs. We hope you find our website easy on the eyes and very interactive, please feel free to request information on any product on our site, our customer service will be glad to help. Deliveries for Lagos Orders take place between 2-3 working days and nationwide deliveries within 2-5 working days. We are constantly working hard on improving our services and hearing from you is key in doing that. We always have something exciting for our dear cutomers, you can buy products for ZERO naira on our site, please check below for details. Adebayo Oke-Lawal is one of my favourite people in the Nigerian fashion landscape. He's supremely talented, extremely dedicated and hardworking, while maintaining an easy likeable affability. In recent years his brand, Orange Culture has received some truly enviable recognition from international fashion decision makers. From American Vogue, to Vogue IT, to Paper Magazine, to Elle, to LVMH......they can't get enough of Orange Culture. One of our own is getting very close to totally blowing up African fashion as we know it and he needs our support. Orange Culture needs to create its new Spring Summer Collection in time for the Pitti Uomo 86 tradeshow; the world’s most important trade fair for menswear and contemporary lifestyle trends, which will be held in Florence, Italy from 17 to 20 June 2014. The spotlight will be shining on the big names of the new classics, on research from the world of accessories, on brands that have revolutionized the meaning of sportswear, all the way to the most avant-garde collections and new talents in men’s fashion. Pitti Uomo is a dynamic showcase of highly creative projects featuring very select brands, special projects by top international designers, and premiere showings of women’s collections at Pitti W. It is a fair that uniquely interprets the myriad connections among fashion, design, food, sport, and new lifestyles. Orange Culture Nigeria one of the youngest brands from the list has been invited to present a brand new collection to the field of international buyers, press and fashion lovers in Florence. How can you help you say? Orange Culture needs financial assistance to undertake this massive and once in a lifetime opportunity, therefore the brand has started a Kickstarter project which will only be funded if at least £5,000 is pledged by Friday, May 30 2014 10:00 PM CET. Please help by pledging whatever you can, every little helps. Go to Kickstarter to donate. Stairwell photo opp why don'tcha? Preened for the budgetnistas in affordable AF Rukky Simone, shirt and skirt together didn't cost up to N10,000. I hear a new collection is launching soon, let me find out its as fab as the last one......au revoir paycheck. Rukky Simone is sold at Grey Velvet, in Lekki Centro Mall and Ikeja Mall. 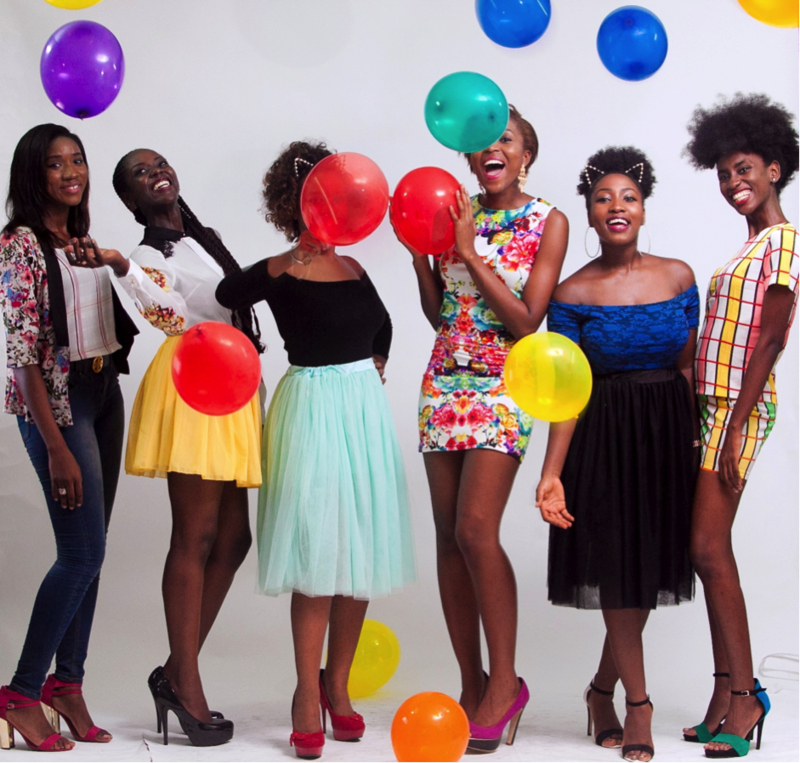 Fashion Protégé, the first fashion reality Tv show in Nigeria, will begin airing today at 8pm on Africa Magic Entertainment Channel 151. The series showcases the journey of the contestants who were shortlisted from pool of hundreds, and chronicles their struggles as they strive to put their stamps on the fashion map. On the first episode, Mentors Lanre Da Silva-Ajayi & Mai Atafo are joined by guest judges at the intense auditions as they sieve through the good, the fabulous and the downright outrageous! Anxiety kicks in for some contestants and they crumble under pressure, while some manage to overcome their nerves and wow the judges! Who will make it through the first cut and stand a chance to compete to become Nigeria’s next big fashion star? You’ll have to watch tonight to find out! 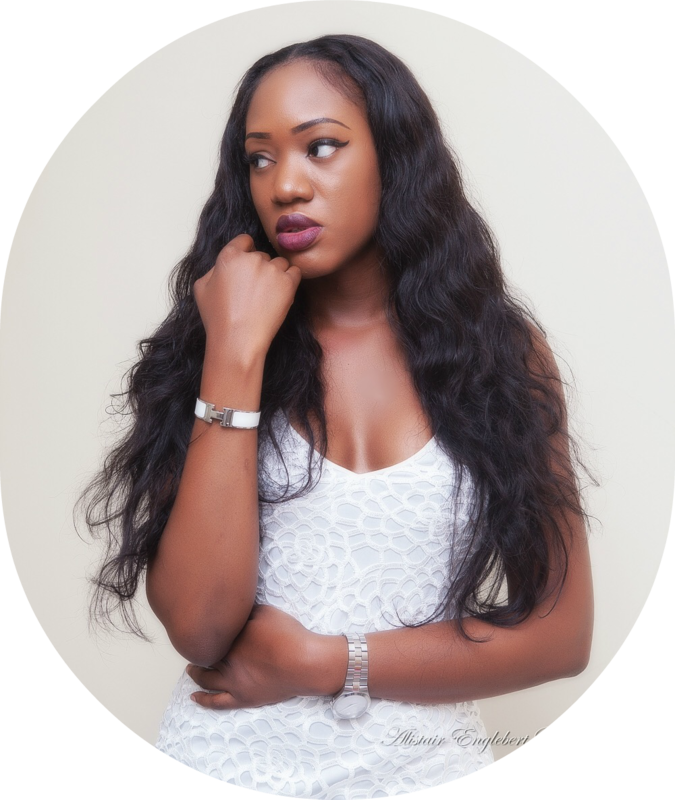 Fashion Protégé hits the airwaves today at 8pm on Africa Magic Entertainment, Channel 151. The show is a five part reality show and will be aired every Thursday at the same time. There will be a rebroadcast on the following days; Friday, Sunday and Monday, at 9:30pm, 8:30pm and 1:00am respectively. I have been a massive no-show on this streets, that's mostly because blogging and everything that comes with it (the posting, attending events etc) became a bit too much for me to handle. Regulars should be used to me having to disconnect for a couple weeks or so every few months because as much as I like to believe I'm superwoman, ever so often I am forcibly reminded that I'm not and I have to give my 100% to the career that keeps me in Maltina. After a supremely sedentary weekend, I crawled out of my bolt-hole to attend my friend Chiz's cocktail event at L'espace. 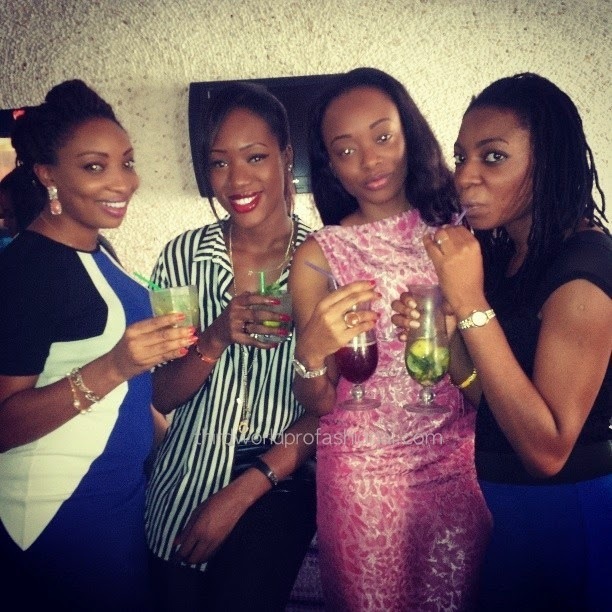 Chiz is the CEO of Elle's Icebox, the baddest cocktail company in Nigeria and the girl knows her way around a bar. I'm not a big drinker, but she hinted there were small chops and before I knew it I was speeding down Third Mainland singing 2 Become 1 in my best Mel C voice. This is me, after healthy servings of small chops. So happy I didn't notice the Mojito being pushed into my hand. Chiz on the left, Ij and Ify to the right. Wasn't really fussed about my outfit, I just made sure it was loose enough to pack away the small chops without detection. I really like this photo (below), if you squint, shape your left hand into a telescope and look very carefully into the reflection of my sunnies you can see my brother Chidi very grudgingly taking this photo. Ohmygosh you guys, I can't believe I almost forgot to mention ASOS Tall. If you're as blessed as I am with legs for dayssss and you're stuck in a country where you cannot adequately clothe such legs due to a lack of statuesque-centric stores, ASOS Tall is here to save your entire life. I usually buy clothes about 2 sizes bigger then amend them, just because they'd have longer sleeves or longer lengths. This is now a thing of the past thank Christ. Here's to regular blogging in Jesus name. p.s. Elles Icebox will be having a karaoke event at L'espace; 19a Olosa street (the one-way street opposite Eko Hotel, you can access it through Karimu Kotun) on Thursday this week from 6pm. Imagine cocktails and karaoke......potent AF. I'm hosting, I love karaoke and sing like a screech owl. Come through and get your entire life. p.p.s Just saw this gif on Buzzfeed, round of applause for Chuck Bass please! 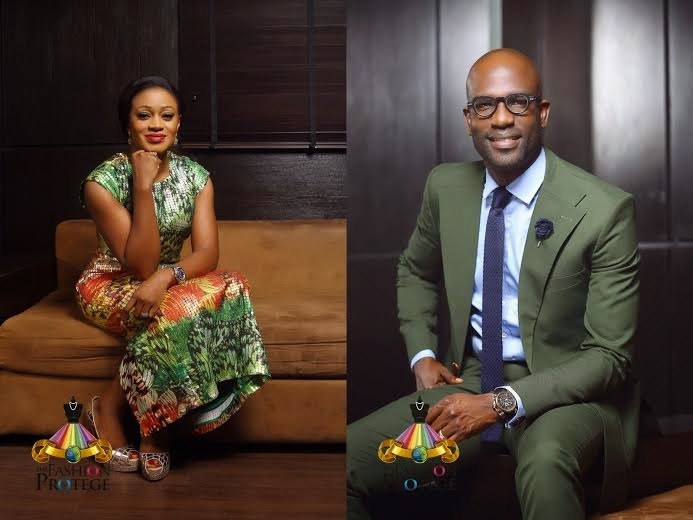 Earlier this week, Fade Ogunro was announced as the host of MultiChoice presents “The Fashion Protége” - a 5-episode fashion reality TV series that was created to celebrate the 20th anniversary of MultiChoice Nigeria. Now we have all the amazing photos from her promo shoot! Fade absolutely stuns in pieces by LDA, Virgos Lounge & Rococo. There has been a lot of buzz and excitement surrounding this groundbreaking show! The Fashion Protége will air on the 15th of May, 2014 on DSTV’s African Magic Entertainment – Channel 151.